Mega Man 8, known as Rockman 8: Metal Heroes (ロックマン8 メタルヒーローズ, Rokku Man Eito Metaru Hīrōzu?) in Japan, is a video game released by Capcom in 1996 and 1997 for the PlayStation and the Sega Saturn. It is the only game in the original series that was released on CD-ROM. Upon its release, Capcom reached the franchise's 10th anniversary, and some limited edition copies of the game were packaged with a color history booklet, celebrating one decade of the series. Mega Man 8 is the second of four games in the entire series to feature anime-style cutscenes. 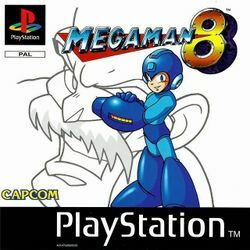 Mega Man 8 was followed by Mega Man 9, which changed the style back to its 8-bit appearance with gameplay similar to the first six installments. In the year 20XX, two alien robots engage in a climactic battle in the depths of space, the ultimate outcome of which causes them both to plummet towards Earth, critically injured. Meanwhile, Mega Man and Rush are battling their rivals Bass and Treble, when Dr. Light calls Mega Man to investigate strange energy readings on a nearby island. On the island, Mega Man finds Dr. Wily, flying away with a strange purple orb. Before chasing him, he sees a damaged robot and asks for Dr. Light to pick it up and try to repair it. Dr. Wily then releases 4 new Robot Masters to combat Mega Man. Japanese Sega Saturn cover art. This page was last edited on 26 August 2016, at 21:26.